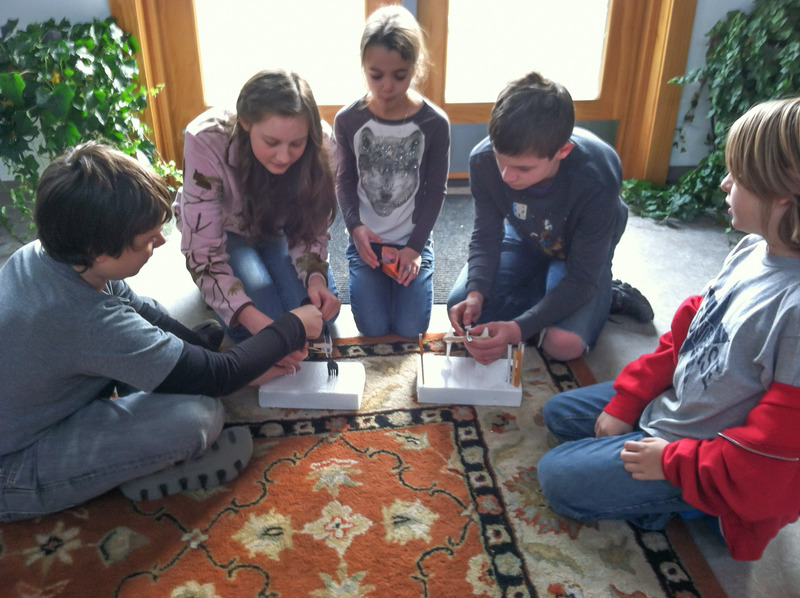 As part of its LRNG-funded Maker Rings project, students at the the Birch School in Rock Tavern, New York, are forming cross-age interest groups and designing their school’s makerspace. All around the country, great makerspaces are popping up that give kids a spot to tinker, make mistakes, and follow their interests. But how many of those makerspaces are also designed by kids? That’s exactly what the Birch School, a small alternative school of 32 students in Rock Tavern, New York, is working on right now. It’s part of the school’s Maker Rings project, one of the projects supported through a LRNG Innovation Challenge Grant. Although it’s just gearing up, the project is supporting a curricular approach where groups of four students, ranging from fourth grade to high school, form small working groups called Maker Rings. These rings take time out of students’ school day to work on a project of their choosing. The collaborative nature of the Rings helps students form interests that can power their projects and supports them in persisting through the making process. The students have also been working on listing the equipment and projects they’d like to have in their new pop-up makerspace while staying within the budget. Kate Fox, codirector of the Birch School, said involving the students in the design process helps them take ownership of their own learning—something central to the Birch School’s philosophy. Fox said the school wants students to learn that their ideas and work have value in their own environment and community. For example, one morning last January started with a discussion about a problem the school was having: screens. Kids were getting distracted, multitasking with cell phones and other devices when they were supposed to be listening or working. The day began by sitting in a large circle and using a “talking stick” to take turns discussing the problem. 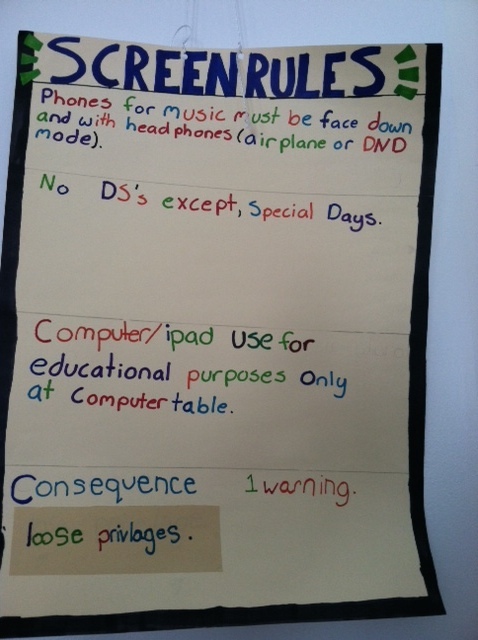 The Birch School’s new rules for screen use. In the end, the group concluded that teachers should give students, who range from ages 6 to 17, one opportunity to get back on track and then take away their devices. And if students (usually those older than 10) want to listen to music while they’re independently working? Just keep the phone face down on the desk. Although the school is working with the Maker Rings project, it’s been developing many other kinds of projects to include in its curriculum. Fox said the Educator Innovator website, specifically its partners page, has been helpful for finding new ideas and resources. Plus, the Birch School had already been using other programs, like GlassLab Games’ SimCityEDU, NaNoWriMo, and the programming language Scratch, before Fox realized they were also Educator Innovator partners. “It’s exciting to see all those resources compiled together, and it has become an extremely useful reference for us,” Fox said. The Maker Rings project is supported by a 2014 LRNG Innovation Challenge grant. These grants grew out of a partnership among the National Writing Project, John Legend’s Show Me Campaign, and the John D. and Catherine T. MacArthur Foundation to support educators in developing solutions to challenges central to implementing Connected Learning. In 2014, LRNG awarded grants to 14 teams of educators working on the challenge of expanding time and space for creative and connected learning in schools. The school is located in a building that it shares with a Unitarian congregation, so the makerspace will be packed up into a classroom at the end of every week. But the “pop-up-ability” also means the school plans to take its space and projects to afterschool programs, the YMCA, festivals, and other community spaces to introduce other kids and families to simple maker projects.